Today I attended the afternoon session of Julien's Auctions Entertainment Memorabilia Winter Sale. 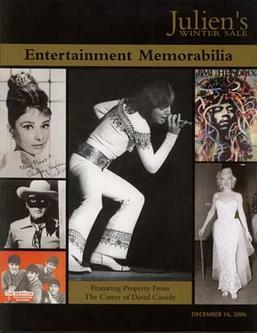 The auction featured property from the career of David Cassidy. It also included memorabilia from Marilyn Monroe, The Beatles, Jimi Hendrix, and more. For those of you that think that attending auctions such as these might be intimidating or that they are only for the wealthy, that isn't necessarily true. I saw items sell in today's auction for as little as $50. Although, there were items that sold for $20,000 and up. A Britney Spears handwritten book report sold for $400. I believe that the most expensive item was a pair of Marilyn Monroe photographs, which sold for $32,000. You might want to check one out in person the next time you get a chance. However, if you can't attend, you can usually make abensentee bids, bid by phone, or online. Visit my collectibles page for more information about where to find high quality celebrity and entertainment collectibles and memorabilia.